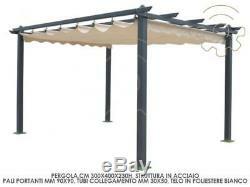 Gazebo pergola arbour tarpaulin retractable ecru 3x4 mt outer garden new version. The description of this item has been automatically translated. Gazebo pergola Arbor retractable tarpaulin white 3 x 4 meters outside garden new version 2018. The product gives a particular elegance to a garden or yard, fully respecting its characteristics of shading. Elegant and sturdy product Aluminium structure Ecru PVC coated polyester top 180 g/sqm Dimensions 300 x 400 Assembly instructions included Quick and easy assembly NEW VERSION 2018 For more info about the products visit our website; You'll find everything you're looking for. How to request an invoice. If your parcel is stranded or in stock we will notify you and to do everything in ns. In accordance with article 5 of legislative decree 185 of 1999, the customer can withdraw from the contract/order signed on the Internet without penalty and without giving any reason, subject to the conditions below. For lack of the essential integrity of the property (the packaging and / or its contents). Using any part of the property and any supplies. The lack of the outer and / or internal packaging. The absence of product components accessories, cables, manuals, parts... Damage to the product for reasons other than its transport. Responsibility We take no responsibility for the loss of products after they have been delivered the goods. Therefore, we reserve the right to change / adapt the technical information of products in the catalog, without any prior notice. The pictures of the articles are indicative and the characteristics of items delivered may differ slightly from the photos in the catalog. Availability Products We reserve the right to accept or decline any orders that are placed and in any case until all the goods. In the event that the item ordered is no longer available, we the right to cancel the request and credit back any amounts paid. Prices Product prices are VAT included.